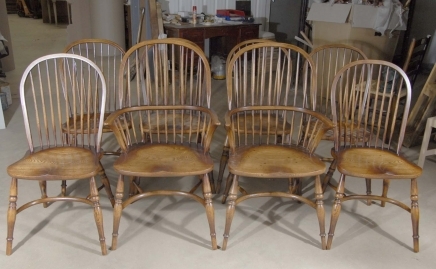 You are viewing a set of 8 Windsor chairs made from the finest English yew wood. The set of 8 consists of two arm chairs and six side chairs. These are the traditional and much loved Windsor chair design featuring the crinoline stretcher, hand turned legs and the saddle shaped seats. They are very comfortable and solid and these are perfect for that rustic cosy farmhouse look. These were made by craftsman at High Wycombe in Buckinghamshire where they have been made using the same materials and skills for centuries. They are called the Windsor chair after the proximity of the town of Windsor, home to the famous Royal castle. This entry was posted in Farmhouse Chairs, windsor chairs and tagged farmhouse chairs, windsor chairs by anti2365. Bookmark the permalink.